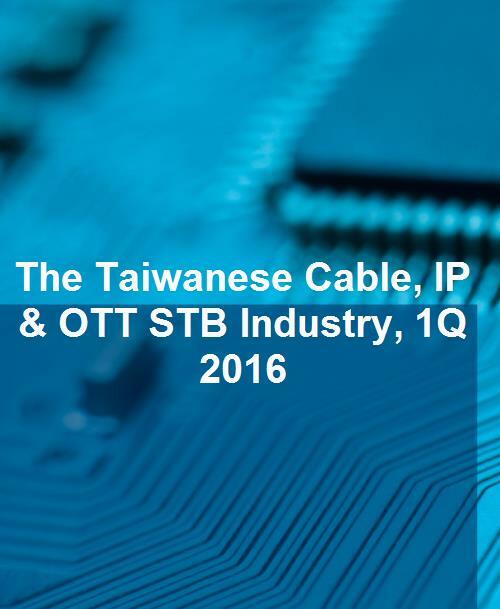 This research report presents Taiwanese cable, IP and OTT STB industry shipment volume and value forecast and recent quarter review of shipment volume, value and ASP, and manufacturer volume ranking. The report also examines price trends, production locations, shipment destinations, business types, and customer portfolios. The content of this report is based on primary data obtained through interviews with cable, IP and OTT STB makers. The report finds that the combined shipment volume of Taiwanese cable, IP and OTT STB industry in the fourth quarter of 2015 reached 22.8 million units, up 19.4% year on year, thanks to the new product launches of Apple and Roku. In the first quarter of 2016, the industry's shipment volume is estimated to have reached 13.8 million, up 3.6% year on year. In particular, shipment volume of cable STBs is anticipated to increase during the January-June period due to the upcoming 2016 Olympic Game in Rio de Janeiro, Brazil.